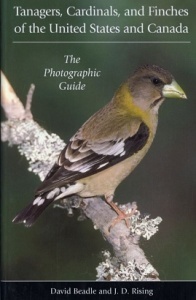 This is the first comprehensive photographic identification guide to tanagers, cardinals, and finches. Many of North America's finest bird and wildlife photographers have supplied a stunning collection of images, some of which depict plumages rarely available in other publications. The 200 photographs have been carefully selected to illustrate age, seasonal, and sexual variation in all of the species found north of Mexico, including introduced species and vagrants. The text is designed to introduce the reader to the biology, identification, molts, vocalization, and distribution of the forty-six species covered. Each photograph is accompanied by a caption outlining relevant identification features, and original range maps illustrate the distributions of all the species that regularly occur north of Mexico. This is a must-have guide for field use by amateurs and professionals alike. 'Beadle and Rising have done an excellent job in covering this diverse group of birds. The book is organized sensibly and scientifically and it is well written and informative.' - Brian Sullivan, Cornell Laboratory of Ornithology.